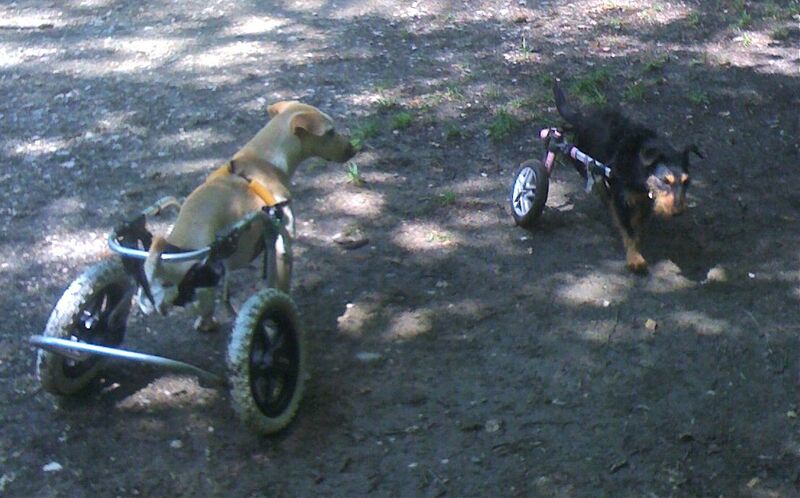 Last week our two-legged dog Sugar (on the left) met a rather grumpy little dog called Stella. Like Sugar, she’s been abused. Not in Taiwan, but in Serbia. Apparently, the production of wheelchairdogs is a worldwide enterprise. And for the record: it’s just us that appreciated seeing these two together. Sugar and Stella didn’t bat an eye. Every French town, no matter how insignificant, has a town hall. It’s the administrative center of the region, provides an office for le Mayor and is the hub of town life. On a beautiful summer morning Spouse and I visited the mairie of our village. We wanted to know if there are any restrictions on paint colors for our house. The current combination of light brown walls and dark oak shutters is depressing us. At the mairie, our plan caused quite some excitement among the three women behind the counter. What color did we have in mind for the shutters? “Blue,” I said, “or green”. More excitement. One of the ladies wagged a finger at us. “Impossible,” she said. Apparently, we couldn’t just pick a color and paint our house the way we liked! Imagine what our village would look like if everyone did that? “Are you German?” one of the ladies asked suspiciously. At that moment a door opened and an amiable man with a beer belly and a moustache rushed out. “German?” he said. “Did I hear German?” It was Monsieur le Mayor. A Berliner by birth, he had married a French woman and settled in our village decades ago. His wife worked and he raised their children. “Being a houseman,” he said with pride, “caused quite a stir here, at the time”. As the children grew up, he became bored. Why not become a mayor? “I had to take the French nationality of course,” he said. “But I also kept my German one. It’s a matter of principles,” he confided. Our tête-à-tête in German, with the mayor, had considerable impact on the ladies behind the counter. Suddenly, a different color for our shutters might be possible after all. A commission would visit our house and, depending on the situation, would tell us which color to take. “But you can forget about blue,” one of the ladies added gloatingly. I used to think that important decisions were taken in the Élysée Palace in Paris. I was obviously wrong.